Liverpool will face Borussia Dortmund, Manchester City and Manchester United in the International Champions Cup this July. 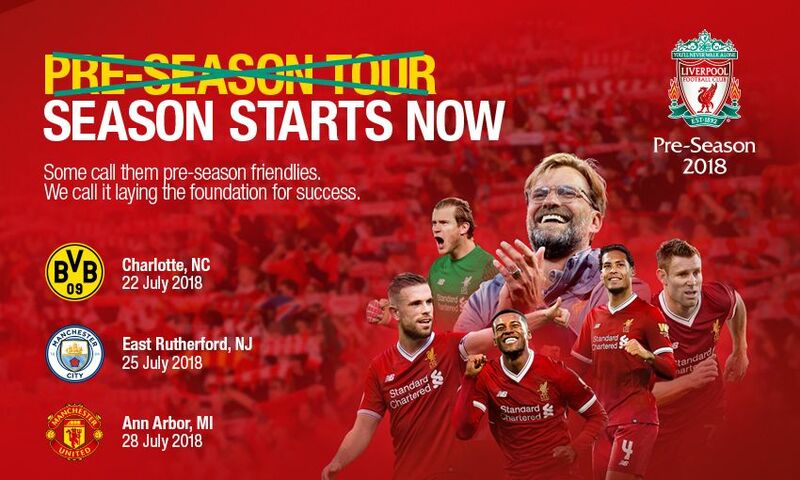 The Reds are heading to the USA for part of their 2018-19 pre-season preparations and are set to come up against some familiar opponents. Jürgen Klopp’s side will play Dortmund in Charlotte, Manchester City in New Jersey and Manchester United in Michigan, in the ICC tournament. Billy Hogan, managing director and chief commercial officer at LFC, said: “Our pre-season tour is always a great opportunity for us to visit our supporters around the world. “We’re really looking forward to visiting America this year and to compete in this fantastic tournament against some great teams. For more information about the International Champions Cup, please visit www.internationalchampionscup.com.